conical seat to fit most aftermarket wheels. 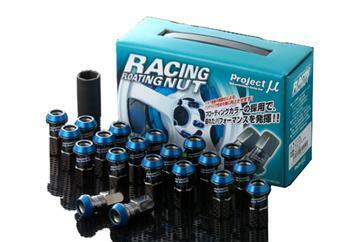 These M12×1.25 or M12×1.50 Super Lock Nut 7 come in packages of 20 lug nuts and come with the special socket adapter. Features SCM435 Alloy construction with a Project Mu aluminium cap. The Project Mu Racing Floating Nuts are made with a floating aluminum collar on nut taper. This super-light and hard nut works to improve contact with the wheel and prevent loose screws. It is made of Chromium-molybdenium steel (SCM435).